Pink eye is caused by a virus infection. It is different than a red eye caused by a bacterial infection or an allergy. Consequently, antibiotic or allergy drops will not properly treat the condition. Viral infections can cause vision loss or problems with glare in up to 15%-35% of cases. Pink eye is highly contagious and proper steps should be taken to prevent spreading the infection. At least 50% of patients with pink eye have the same virus on their hands according to a clinical study. Proper in-office treatment can reduce the course of the infection significantly. A typical viral infection of the eye, or pink eye, can last between 2 to 4 weeks. In-office treatment can shorten that time to 2 days. For more information, contact Bright Eye Care & Vision Development. Ortho-K can help slow progression of nearsightedness by up to 50%. This treatment gently reshapes the cornea. As a result, neither glasses or contacts are needed during the day to see well, and myopia progression can be slowed down. The safety and effectiveness of this treatment has been shown in multiple clinical studies involving elementary school children. Myopia, or nearsightedness, is believed to be caused by multiple factors occurring in one individual. 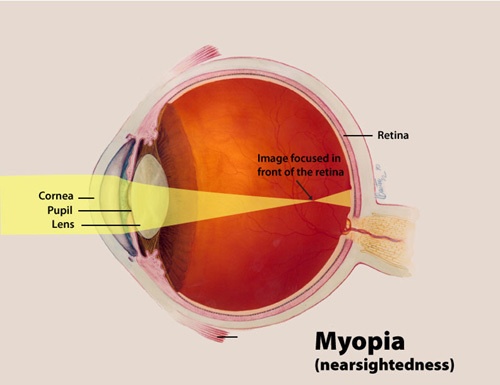 In other words, there are many factors that seem to be associated with myopia development. For example, recent research indicates that first-born children are more likely to have myopia than younger siblings. 20/60 eyesight is the minimum level of visual acuity needed to see the board in a typical classroom. This level of acuity will only allow for basic recognition, but it won’t be easy or sustainable. 20/20 eyesight is the level of visual acuity needed to physically read a typical 8th grade level book. 20/25 eyesight is the level of visual acuity needed to physically read a typical 4th grade level book. Someone who only has 20/40 eyesight would only comfortably be able to sustain reading print that is the size of newspaper sub-headlines or a typical 1st – 3rd grade book. There are visual skills other than eyesight that can affect sustainability of reading. Some children, even if they can see 20/20, have a difficult time reading for lengthy periods of time or reading at a proper rate because of poorly developed visual skills. Focusing accuracy, eye coordination, fine eye movements, focusing flexibility and other visual skills will affect school activities like copying from the board, filling out Scantron sheets, reading comprehension and more. Visual acuity and visual skills are both important in daily school activities. 1. Leone GE, Bigelow CA. Does print size matter for reading? A review from vision science and typography. J Vision, 2011; 11(5): 1-22. 2. Holladay JT. Proper method for calculating average visual acuity. J Ref Surg 1997; 13:388-391.